It may or may not be significant that, since early spring, no accounts of research on nuclear fission have been heard from Germany — not even from discoverer Hahn. It is not unlikely that the German government, spotting a potentially powerful weapon of war, has imposed military secrecy on all recent German investigations. A large concentration of isotope 235, subjected to neutron bombardment, might conceivably blow up all London or Paris. THE Fifth Washington Conference on Theoretical Physics was sitting in solemn conclave when the news broke. Professor Nils Bohr of Princeton and Professor Enrico Fermi of Columbia rose to open the meeting with an account of some research going on in a Berlin laboratory. Professors Bohr and Fermi are Nobel Prize winners both, and their names are as well known to scientists as Toscaninni’s is to music lovers. The Conference therefore expected something extra special. They weren’t disappointed. It was January 26, 1939. A few wees before, at the Kaiser Wilhelm Institute in Berlin, Dr. Otto Hahn, a distinguished German physicist, had obtained an utterly unexpected result from some more or less routine experiments. Following the original example of Professor Fermi, Dr. Hahn and his co-worker, F. Strassmann, had for many months been bombarding uranium with neutrons and studying the debris left by this atomic warfare. It would not have surprised them at all to find radium as one of the products. In fact, they had done so before, or thought they had. Radium and uranium are near neighbors in the table of elements, and it is nothing new for scientists to transform one element into another close to it in weight and electric charge. But it was news, and big news, to discover barium among the debris — barium, which is only a little more than half as heavy as uranium. It meant that the neutron bullets had succeeded not merely in knocking a few chips off the old block, but in blowing the whole atom asunder with a terrific explosion. The theoretical and practical import of Hahn’s discovery may not be immediately obvious to the laymen. The article will attempt to interpret its significance in later paragraphs. But on the scientists, the news had the same effect as the tidings of gold in California had on the Forty-niners. They flew to their laboratories to find the treasure for themselves. A few insiders had already jumped the gun ahead of the Conference and of the rest who learned of the discovery through the newspapers. In Copenhagen, Dr. O. R. Frisch and Professor Lise Meitner, who had previously worked with Hahn on the same problem, had verified his results ten days earlier. A group of Columbia University physicists, including Fermi, independently thought up and carried out a similar experiment by January 25, the day before the Conference. By the time the meeting wound up its affairs January 28, three more laboratories — at the Carnegie Institution of Washington, Johns Hopkins, and the University of California — joined the chorus of confirmation. In a word, Hahn was right. Uranium, and thorium, too (thorium is also among the heaviest elements), had been split in two by neutron bombardment. THE phenomenon was quickly dubbed “nuclear fission,” and in the months ensuing since its discovery, nuclear fission has grabbed the spotlight from the “heavy electron” sensation of 1937-8. Dozens of the world’s top-flight physicists have been busy as bees, roaming the clover of a new field of research. The first task of the investigators was to get a picture of what had happened. Dr. Frisch and Miss Meitner promptly supplied a pretty good one. The nucleus of an element, they pointed out, is now thought of as an aggregation of protons and neutrons packed together into an inconceivably small space. The number of protons, or units of positive electric charge, accounts for the chemical behavior of the element. Neutrons are units of weight and have no charge. Together the neutrons and protons make up the mass of the nucleus. The simplest nucleus is the single proton belonging to the lightest element, hydrogen. Going up the atomic scale, adding one proton and a varying number of neutrons for each successive element, we arrive at last at uranium. This heaviest of elements is invariably characterized by its 92 protons; in its commonest form it contains 146 neutrons as well, giving it a total weight of 238. Two other forms, weighing 235 and 234, also occur in small quantities. These are called the three natural isotopes of uranium, and are distinguished by the shorthand symbols U238/92, U235/92, and U234/92. Now all the known elements heavier than mercury — that is, thallium, lead, bismuth, polonium, radon, radium, actinium, thorium, protactinium, and uranium — have isotopes that are naturally radioactive. Their nuclei are so complicated that occasionally one will spontaneously simplify itself by shooting off a particle. We can picture the process nicely if we imagine for a moment that the radioactive nucleus is like a drop of water, composed of many molecules. One of the molecules near the surface somehow acquires a little more energy than its fellows and evaporates. The stage is now set to return to Dr. Frisch and Miss Meitner, whom we left some paragraphs ago. Their conception of the nuclear fission process continues the analogy of the drop of water. Suppose the H20 molecules are violently agitated by a source of energy outside the drop. Instead of evaporating gradually, the drop splits in two. Similarly, a uranium nucleus, stimulated by the impact of a neutron bullet, may divide into two smaller nuclei of roughly equal size. These fragments are in themselves unstable, and quickly disintegrate to form still other nuclei. In fact, a whole series of transmutations generally follows the fission of uranium or thorium. Since Hahn first found barium among the products, he and other investigators have identified antimony, tellurium, iodine, xenon, caesium, and lanthanum in one group; bromine, krypton, rubidium, strontium, and yttrium in another, with many possible additions. The explanation is simple enough. The original fragments contain too many neutrons in relation to their proton content, and must get rid of them to achieve a stable form. One of two things happens. The nucleus may simply expel a whole neutron, reducing its weight by a unit. Or one of the neutrons may be converted into a proton plus a negative electron inside the nucleus, which promptly ejects the electron. In the latter case, the nucleus remains approximately the same weight but acquires an additional positive charge, thus becoming a chemically different element. Experiments have proved that both these types of disintegration actually do take place. No one knows yet whether the same two original products are always formed when uranium divides, or what they are. But if one of the fragments is barium, with 56 protons, the other must have 92 minus 56, or 36, protons, which would make it an isotope of the gas krypton. In a discovery like this in the realm of pure science, it is always easier to see the theoretical importance than to find a practical application. The fission of uranium has provided a field day for the physicists who like to take atoms apart and find out what makes them tick. It adds a new chapter to their knowledge of the nucleus — the forces that hold it together, the collective behavior of its constituent parts, its reaction “under fire,” its destiny. In addition, it clears up a mystery of long standing, dealing with elements heavier than uranium. When, in 1934, Fermi began his experiments with uranium, he soon found that negative electrons were always emitted under neutron bombardment. We know now that they are usually the products of the chain reactions just described; but at that time nuclear fission was not even dreamed of. Fermi naturally concluded that the uranium nucleus captured the neutron, converted it into a proton and expelled an electron. When the announcement of nuclear fission came, it was immediately realized that the electrons were not in general emitted by the uranium nucleus itself but by its lighter fragments. The mystery of “transuranic elements” was practically solved. It does seem, however, that a neutron bullet occasionally fails to give its target quite enough energy to divide; the uranium isotope disintegrates by electron emission and really does form a new element with 93 protons. But one such problem child is far better than 16. So much for the theoretical significance of nuclear fission, far-reaching though it is. It is pretty hard to amass as much weight on the practical side of the balance. But our imaginations are immediately seized by the terrific amount of energy liberated when a single uranium nucleus explodes. The two fragments fly apart activated by some 200,000,000 electron volts — a total far greater than that associated with any other atomic phenomenon except cosmic rays. The tabloids love to write of blowing up the world with a gram of matter, and it’s not such a sensational idea as one might think. Even a tiny mass has an enormous potential of energy if it could but be freed. It is just such a conversion of mass into energy that speeds the fission fragments on their way. The weight of any nucleus is never quite equal to the sum of its individual protons and neutrons. A small proportion of their mass, called the “packing fraction” or “mass defect,” is somehow transformed into the force that holds the nucleus together. Otherwise the positively charged protons would all repel each other and scatter in every direction. The packing fraction for uranium is, because of its large number of particles, greater than that for the simpler elements into which it divides. This difference in energy is released with the two fission fragments. OF course, 200,000,000 volts is an astounding energy compared with the size of the bodies which possess it. But for practical purposes it is absurdly small, amounting only to about three ten thousandths of an erg. In more everyday terms, it would take 25,000 billion fissions per second to produce one horsepower — figures which dwarf even the national budget. The very best a laboratory can do so far is produce a few hundreds per second. If atom smashing could be made more efficient, power production by means of nuclear fission would not be beyond the realms of possibility. But under present conditions, the process is as inefficient as removing the sand from a beach a grain at a time. Or, more graphically, it is like shooting with buckshot at a netwood of beads strung yards apart. The size of the target is comparable with the size of the projectile, the empty space between targets is enormous compared with the diameter of either, the stream of bullets cannot be well controlled or aimed, and therefore it is much more probable that the neutron projectile will fly past a uranium nucleus than to score a direct hit and be captured. In fact the chances are thousands to one against fission taking place. where the superscripts are the atomic weights and the subscripts the charge. The stream of positive particles from the cyclotron may also be used to bombard beryllium and thus produce neutrons. The high energy and great number of cyclotron particles make them more efficient neutron makers than the natural radio-alpha particles. Once created, the neutron beam is directed against a uranium target. The products are studied in various ways. If the investigators want to find the energy of the fragments, the target is placed in an ionization chamber, filled with a gas at low pressure. The fragments rip through the gas atoms, disrupting their outer electron structure to form ions. The gas ions are drawn to a wire where they constitute a tiny electric current, and the magnitude of this current gives a clue to the energy of the fission products. If the experimenters want the range of the particles — that is, the distance they travel before their kinetic energy is all used up — they may choose a Wilson cloud chamber which automatically photographs the track of ions the nucleus leaves behind it. If they want to know the number of fissions occurring in a given time, they have an electric counter at their command, based on the same principle as the ionization chamber. A modification of the same instrument is used to look for electrons or neutrons emitted in the fission process or in the chain reactions that follow. The problem of identifying the prod ucts is a somewhat different one, and is complicated by the large number of elements which may be formed. Here the debris is collected on a sheet of Cellophane or paper placed close to the uranium target. Each variety of isotope on the sheet has a definite rate of disintegration — it may be anywhere from a fraction of a second to several days — and this time is characteristic of the element to which the isotope belongs. To measure this period of decay, the collecting paper is placed near an electric counter. If the activity of one product decays to half its original value in 87 minutes, for example, that product is immediately known as an isotope of barium, Ba139/56, which is known from other experiments to have a characteristic “half life” of 87 minutes. The difficulty of this method of identification is, of course, in separating the half-live when two or more elements are decaying together; and also in classifying a half-life belonging to an isotope previously unknown. 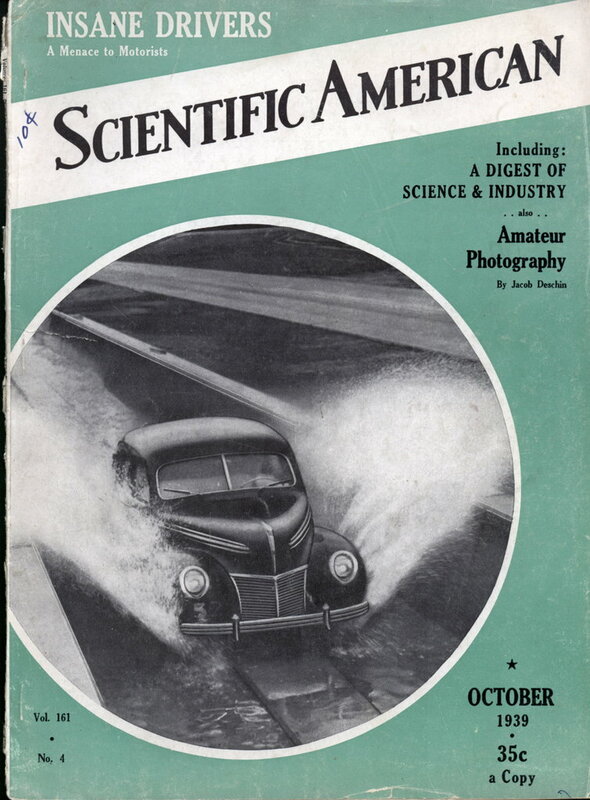 Another method of studying the products is to perform the experiment under water, then analyze the water chemically. Suppose we suspect that a few nuclei of radioactive lanthanum are present. This is too small a quantity to separate directly. But if a larger amount of a stable lanthanum compound is added to the water, both stable and un-stable lanthanum atoms can be precipitated out. If this precipitate is then shown to be radioactive, we have proved our suspicion was correct. Similarly the water can be tested for radioactive barium by adding a stable barium compound and so on. STILL a third attack on the problem of identification has been made by Philip Abelson at the University of California. He had been studying the natural X rays from the supposed “transuranic elements”; and put on the right track by the discovery of nuclear fission, he quickly showed that these X rays had wavelengths characteristic of iodine and tellurium. Research along all these lines is proceeding at breakneck speed. Experiments similar to those with uranium have been performed on thorium (Th232/90) with similar results, except that only fast neutrons are effective in splitting the thorium nucleus, while both fast and slow work well on uranium. Other heavy elements, such as gold and tungsten, show some slight tendency to undergo fission. Fermi and others have been trying to determine which of the three uranium isotopes are involved, and how the process is related to the speed of the neutron projectiles. Duke University scientists are investigating gamma radiations connected with fission, and the University of California is piling up data in all branches of the research. Bohr at Princeton, Solomon in Paris, and many another are concerning themselves chiefly with theory. Irene Curie and P. Savitch, who were responsible for much of the ground work enabling Hahn to identify the products of his fission experiments, have been carrying on the classification work in Paris. Joliot, as well as groups of physicists at Columbia, the Carnegie Institution, and Cambridge University, have concentrated on the study of secondary neutrons emitted at the moment of fission and in later reactions. The latter problem brings up an interesting and rather disturbing aspect of the case. These secondary neutrons constitute a fresh supply of “bullets” to produce new fissions. Thus we are faced with a vicious circle, with one explosion setting off another, and energy being continuously and cumulatively released. It is probable that a sufficiently large mass of uranium would be explosive if its atoms once got well started dividing. As a matter of fact, the scientists are pretty nervous over the dangerous forces they are unleashing, and are hurriedly devising means to control them. It has been impossible, even in this long article, to mention all the thousand aspects of this fascinating phenomenon, or name many of the able contributors to the sum of information amassed since last January. But the fact remains that nuclear fission is the most important scientific discovery of the year, and holds who knows what promise for the future. 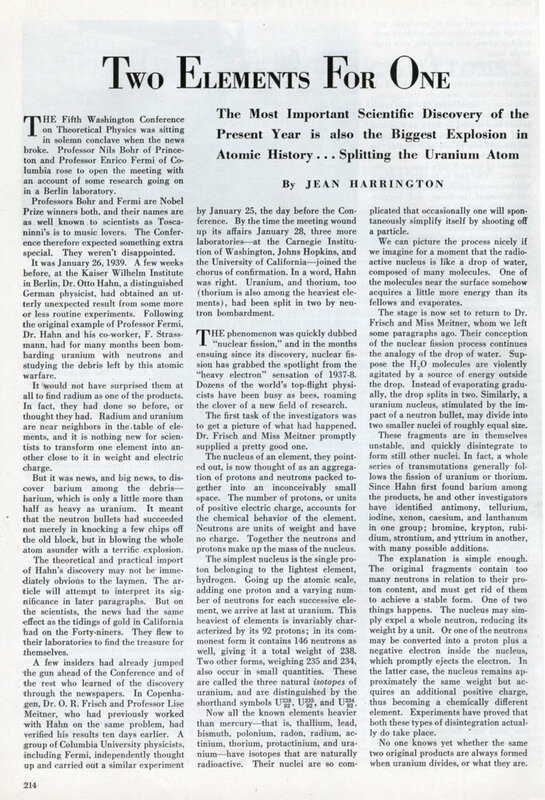 [A lecturing professor displays 1 pound of uranium ore]….If in one instant I could suddenly release that energy here and now it would blow us and everything about us to fragments; if man could feed [uranium energy] into machinery…..
‘It would mean a change in human conditions that I can only compare to the discovery of fire, that first discovery that lifted man above the brute. We stand to-day towards radio-activity as our ancestor stood towards fire before he had learnt to make it. He knew it then only as a strange thing utterly beyond his control, a flare on the crest of the volcano, a red destruction that poured through the forest. So it is that we know radio-activity to-day. This—this is the dawn of a new day in human living. At the climax of that civilisation which had its beginning in the hammered flint and the fire-stick of the savage, just when it is becoming apparent that our ever-increasing needs cannot be borne indefinitely by our present sources of energy, we discover suddenly the possibility of an entirely new civilisation. The energy we need for our very existence, and with which Nature supplies us still so grudgingly, is in reality locked up in inconceivable quantities all about us. re-use it under the terms of the Project Gutenberg License.